Two weeks ago we brought you some games that didn’t have much at all in common. To make up for that, today we’re bringing you two games that are linked at their very core. One is about game development and managing a game dev studio. The other is a psychological horror adventure. Like we said, basically the same exact thing. So, instead of quitting your corporate job to make the next indie masterpiece, maybe play these games side-by-side first. Yay new games, thanks Chrono! But I already got DISTRAINT, more saving for me it looks like. Think I will pass based on @coralinecastell 's review (unless anyone wishes to controvert?). Well if @coralinecastell don’t like it we must burn it to the ground! It has also been freely given away several times very recently. Man I’ve been saving up for a couple months but I finally got a game. This site and community rocks. I honestly love how they’re is so many people that share awesome stuff across this site. Hopefully one day I could get a sponsorship. More people need to know how cool this site can be. Jokes aside (or are they? ), THANKS CHRONO FOR BEING AWESOME AND GIVING AWAY FREE GAMES. Is there anyone we should maniacally tag on this post? 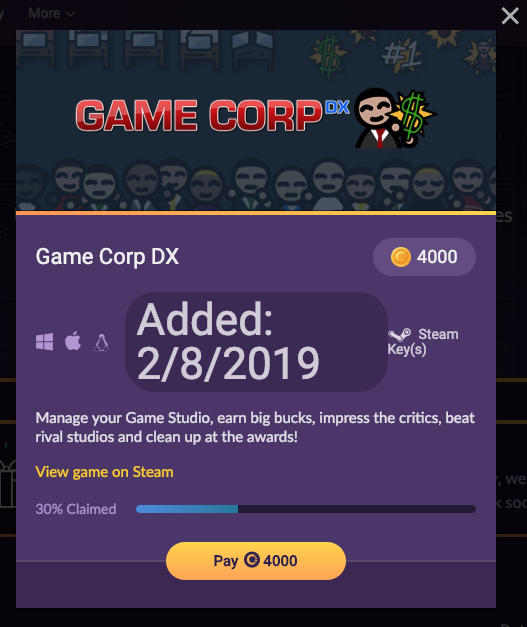 if Game Corp DX is similar to that Battle royal game they have, then it’s not worth getting either. You got more fun playing some flash games on Kongregate. Give me a bit and I will set up a “Sticky Post” about The NEW COIN SHOP, OK? Then if need be, you can direct them to that thread. Yes, I, finally, deleted a few threads. Not. Very. Happy! euh, u deleted my thread though Lonin actually “liked” it? I feel you dude. I’ve had two posts in the past couple days deleted.To be honest it’s starting to trigger me a little bit. I agree with you, wholeheartedly. I don’t know how they missed it. But there are people that have tunnel vision and all they see is what they want to see. As @Fraggles said the other day, you have to remember this is a store and a business and everyone in this forum represents Chrono.gg. Wouldn’t even have to clutter the icon up tbh. I’d add it to the expanded details when you click the icon. I went looking earlier and was a little surprised I couldn’t actually find a date when the game was added even though you can sort the games by this metric. I think bold letters in a super huge font cluttering the entire screen should do it. What do you guys think?